At Paladin, we are to committed to charitable giving and investing in people and organizations who work hard for those who have greater needs. And because everyone can use a helping hand, support or guidance at one point or another, we launched our Paladin Gives Back: Power of One Reference program, and we’re proud to announce we’re seeing compelling results. One of the charities we’ve worked closely with for years, and have remained loyal to in this endeavor is Opportunity Junction, an organization that fights poverty by helping low-income Americans garner the skills and confidence necessary to both attain and sustain jobs that will help support themselves and their families. 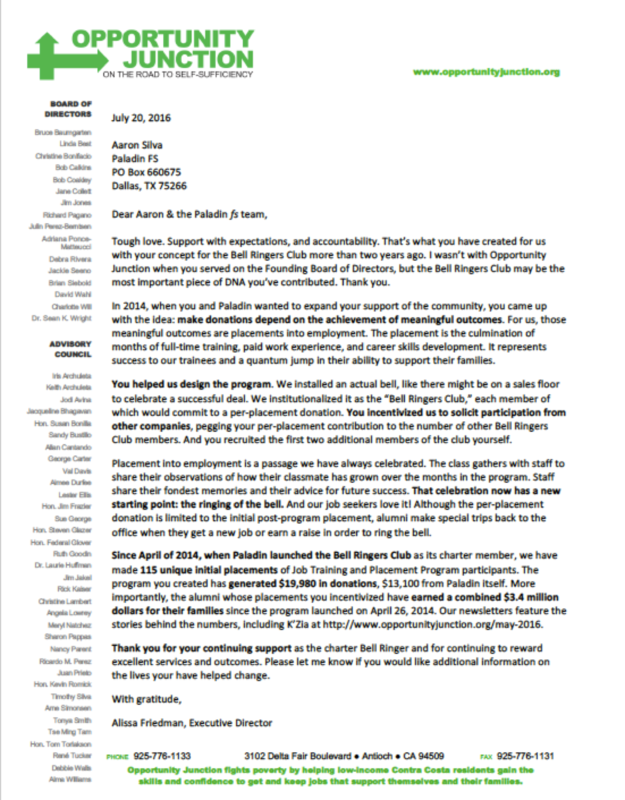 We would like to share with you the below letter our team recently received from Alissa Friedman, Opportunity Junction’s Executive Director, as a clear example demonstrating the payoff our charitable dollars have generated within the community.